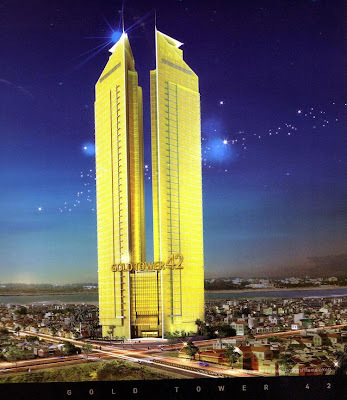 Cambodian officials have attended the official sales launch of the first-ever skyscraper in the capital, Phnom Penh. The twin towers are to be 42 storeys high - almost three times higher than the current tallest building. It is the first of three skyscrapers planned in the capital, where the skyline has been kept low - in part to avoid overshadowing royal palaces. 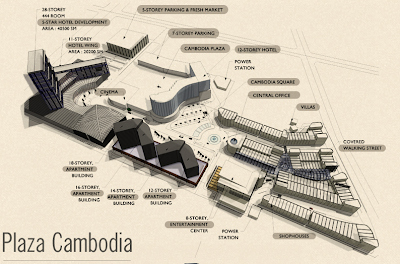 But the government has encouraged the new buildings as symbols of Cambodia's development after decades of conflict. 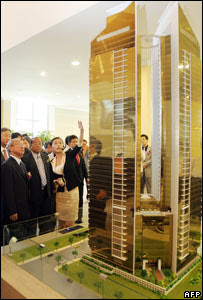 Although Gold Tower 42 is some way from completion, the launch of its show apartment and sales office attracted government ministers and overseas ambassadors. The BBC's Guy De Launey, in Phnom Penh, said the launch gave a taste of the shape of things to come. He said the solid, imposing, gold-faced structure would stand out from its neighbours on Norodom Boulevard - an area of yellow-washed, wooden-shuttered French colonial-era buildings. 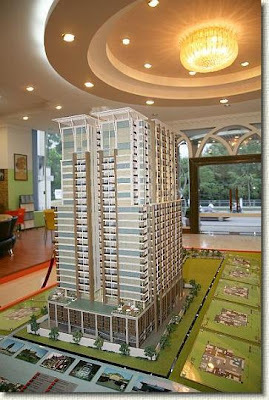 But Phnom Penh is in the middle of a real-estate boom - and some residents hope that building up will bring the price of homes down. 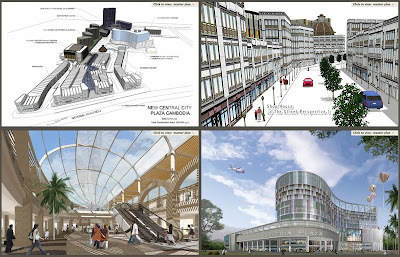 "It's more affordable for people wanting to stay in town, and I think it's good. It's secure and they have all the facilities," one resident said. 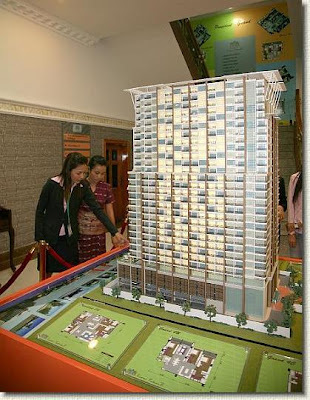 But other locals worry about the effect tall buildings will have on the city's character "The original Phnom Penh city [was developed to] be horizontal, not vertical," one resident said. 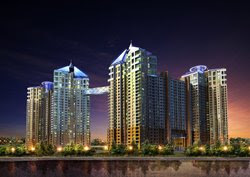 South Korean companies are building Gold Tower 42 and another even taller skyscraper near the Mekong River. OR Watch it live on YouTube! • BK Global's first case of the kind in Cambodia. of BK Global, with the full scale sponsorship of BK. Global and KoRED Housing provided. housing facility, which has been evidenced in Koreaby KoRED's achievements. • Co-promotes a large scale energy project with several multinational partners for developing oil and gas • assets on several onshore blocks of Cambodia. • Under feasibility study for investing in hydroelectric power plants along the Mekong Basin and other waterways of Cambodia. 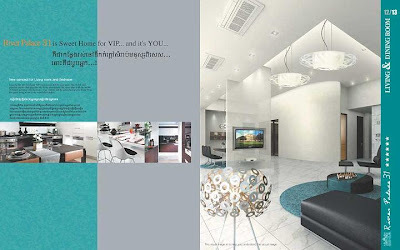 Cambodia is entering into one of the international business key zones. A solid investment in the essential areas of its national economy embracing industrial and civil infrastructure, energy development, etc. is urgently needed in its every city and village. The BK ASIA PACIFIC acts as an agent for attracting funds from investors of Korea and other countries as well as providing a technical and business know-hows from its corporate partners. 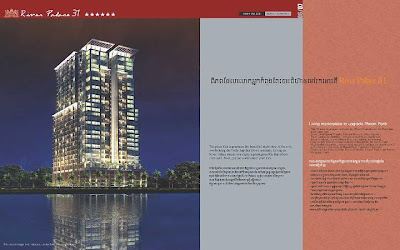 As it already undertaken a construction project for a trend-setting housing complex by the Mekong River as its first big business in Cambodia, the BK Asia Pacific and its corporate parent, the BK Global, are introducing a new era to Cambodians with regard to the residence culture. The joint operations of the partner companies cover various business sectors, such as private financial business, exploitations of oil and gas assets (onshore and offshore) & other energy-related business, electric power plant & transmission industry, and real property business. Any of the above-mentioned industries is to be recognized as essential parts for enhancing the sustainability of the rising Cambodian economy. 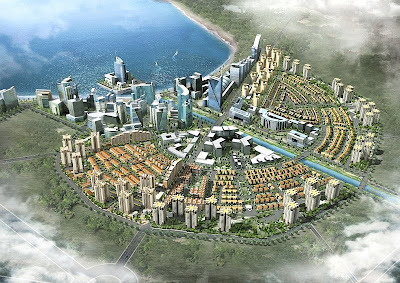 The BK ASIA PACIFIC's first big project in Cambodia, whose site area reaches over 49,000m2, is now under way. 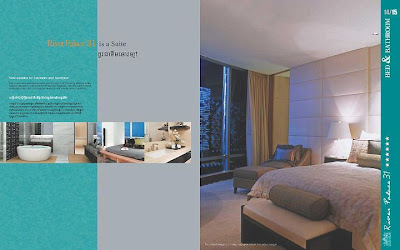 Designed by top level designers of Korea, this luxurious residence will be furnished with world class convenience facilities applied with the advanced technology. 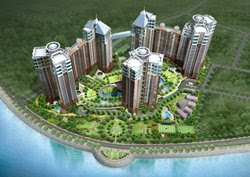 More than 90 percent of its apartments is expected to command magnificent view of the great Mekong River. 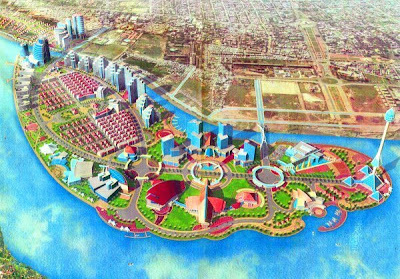 The Phnom Penh SEZ (PPSEZ). 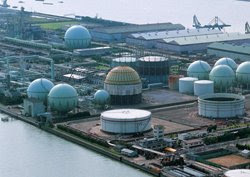 With its first class infrastructure which includes, inter alia, a reliable power supply, a waste water treatment facility, a fast telecommunications network, a “one-stop service” for your imports and exports activities… the PPSEZ has also been designed to occupy a strategic place in Cambodia’s fast growing economy. 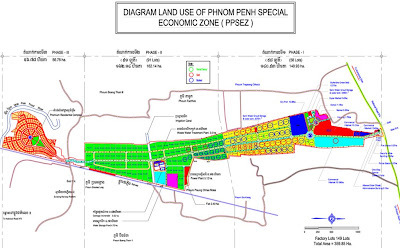 Conveniently located in the heart of Cambodia at around 18 km from the Capital-city of Phnom Penh, just 8 km from the Phnom Penh International Airport and linked to the deep sea port of Sihanoukville by Highway #4 and by a railway line, PPSEZ is going to be the most convenient place for you to capitalize on the many opportunities offered by Cambodia. Despite its limited domestic market of 13.5m people, Cambodia has emerged from decades of unrest and civil strife as one of the safest places and one of the fastest growing economies in the region. Last year’s GDP growth of 13.1% has beaten all expectation. By optimizing its membership in ASEAN (1999) and in the World Trade Organization (2004), Cambodia has made tremendous efforts in quickly integrating its economy into the regional and global trading system. This is one of the 3 Least-Developed Countries (LDCs) in ASEAN that has been able to maximize its status as an LDC. Cambodia’s export products enjoy duty-free and quota-free (DFQF) treatment to the European Union (except for weapons and ammunition), to Canada (except for dairy products and eggs), to Australia, to New Zealand and to Norway. It also enjoys DFQF for more than 8,000 tariff lines of the USA, Japan, the Republic of Korea and China have also extended similar treatment for many products from Cambodia. ASEAN’s original 6 members have also extended duty-free access to Cambodia products under the ASEAN Integration System of Preferences (AISP). Therefore, producing in Cambodia for export to the above markets is the most economic way and the fastest way for you to propel your company’s products to the world market. the SEZ Committee with its “one-stop service” chaired by the Prime Minister himself, responsible for especially addressing investments in the Special Economic Zones (SEZ). On top of this structure, your grievances and your concerns will also be addressed in a government-private sector forum held every 6 months under the chairmanship of the Prime Minister and with the presence and interaction of all members of the Royal Government. With such a receptive Government, with a quite good political stability, with a quite good macro-economic stability, with a reasonably sound, transparent and predictable legalframework, and with such exciting trade preferences as offered to you in Cambodia, why not investing now? 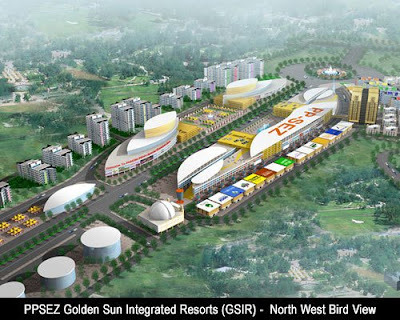 The Japanese-designed PPSEZ is certainly a prime place for you to explore and to prosper. I am looking forward to welcome you to the Land of Angkor Watt, one of the Seven Wonders of the World! by 2010 and abolished by 2018. ◆Ample room for export growth in particular to the US, which will be a key driver for increased exports. -　To support capacity building ,Cambodia took advantage of the Integrated Framework of Trade Related Technical Assistance, a joint taskforce of 6 international institutions including the World Bank. ■　Focus for ministries and their development partners to explore ways to improve service delivery. ◆A framework for ongoing, structured dialogue between business and the Government with the view to improve the business environment. ・The NBC will continue with the managed float exchange rate policy. -　No interventions have been and will be made to target a specific exchange rate.